THIS home is truly one of a kind, in style, in location, and in quality and lifestyle. A truly unique design, with top-of-the-range appliances and fittings throughout the home, nothing but the best, even the swimming pool is top of the range, with a magnesium lap pool and spa, this home is luxury at its finest. 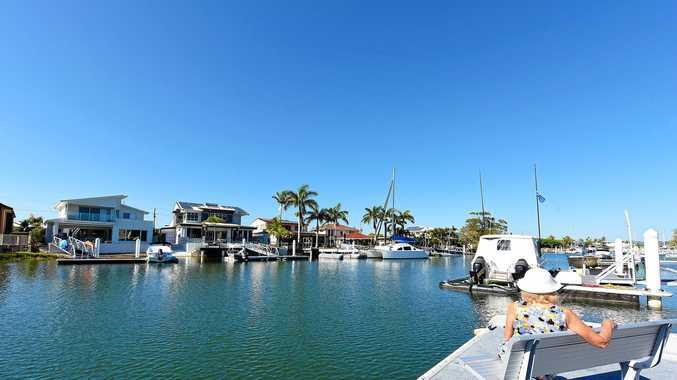 Houses in this quiet, sought-after location in Buddina, directly across from the Mooloolaba Yacht Club, rarely become available and when you view you will see why. With water frontage on both sides of the street, this house is situated on the canal, with its own private pontoon, so you can be on the water in no time at all. Here are just some of the magnificent features of this property - starting with the main living area it faces out to the water and features bi-fold doors right across, opening out to the outdoor undercover entertaining area on the waterfront, allowing the outside in - with expansive views. Overlooking the pontoon, with privacy blinds to the side, this area is made for relaxing and entertaining. The open plan lounge area, that extends to this outdoor area, features its own wet bar with instant Zip-hot water built in. There are also bi-fold doors that open out to the second outdoor entertaining area by the large Magnesium lap-pool, with spa function over the sitting steps. Solar heated with a water feature and lights throughout, and remote-operated shade-cloth over the top, this area is perfect to entertain or to relax and unwind. The open plan kitchen, facing onto the water on one side and the pool on the other, features an island bench in the middle, double sink with instant Zip-hot water system, soft-close drawers, built in microwave, dishwasher, steamer-oven, oven, double-plumbed in fridge, and Bi-fold windows and servery out to the pool area. Upstairs the master bedroom is north-facing, king sized, with its own deck, walk in wardrobe, ensuite with double shower and double basins and a separate vanity area. Separate toilet for both upstairs bedrooms. The second upstairs bedroom is also king sized, with its own deck and built-in robes. Downstairs is the third and fourth bedroom, both king size, with extra-high ceilings and built-in robes. The main bathroom features a large bath tub with separate shower and toilet. The second bathroom features a shower and basin, and connects to the large laundry. There is also an attic/storage room. The entry features a home office with separate front access and plenty of points plus C-bus and multiple TV points throughout the home. Split system air-conditioning in upstairs bedrooms, ducted-air conditioning in downstairs areas. Extra-high ceilings are throughout downstairs areas and tiled throughout all living areas and pool area. Double garage with storage area, as well as a carport or storage shed and plenty of room for a caravan behind the gated entry. There is so much more than meets the eye on this one.